The Israelites complain; God sends manna and quails. Enough to eat without hoarding. VU279 You God are my firmament (Miriam Therese Winter) Lovely song with words of God being our shelter, guide, and nourishment, with a simple chorus "I will give thanks, I will sing praise with all of my heart, all of my days". ATW 474 You're like the sun that warms me / Bread of angels (Robin Mann) This is a nice ballad, a favourite of many in our congregation. It may not be easy for a congregation without some introduction because the structure is a little tricky. Lyrics. 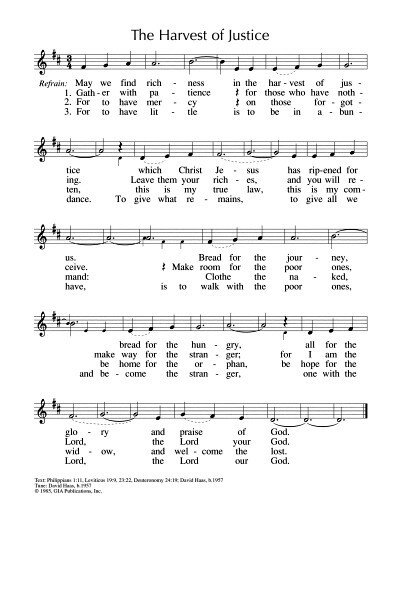 GC840 / GC(II)818 / G(3)910 / CP085 / 82Hml-343 Shepherd of souls refresh and bless (James Montgomery) Old fashioned inclusive words to a standard hymn tune. "Shepherd of souls refresh and bless thy chosen pilgrim flock, with manna from the wilderness and water from the rock". TiS 569 / AHB 478 / NCH18/19 / CH167 / UMH127 / VU651 / LBW343 / ELW618 / StF465 / A&M652 / HPP432 / GtG065 / PH281 / CP565 / CP(E) 455 / W&R501 / Cha622 / 82Hml690 / StF465 / Lau960 / MP201 Guide me O thou great Jehovah / Redeemer (William Williams) A rousing hymn of God’s presence and strength and making it to the other side. "Bread of heaven, feed me now and evermore." Sound sample and lyrics. Oldy-but-a-goody. A song of thanks, including references to the Israelites coming out of Egypt and God providing food and water. TiS 755 / ATA 196 / CH804 / VU884 / SFFS 2278 / A&M484 / HPP219 / GTG080 / CP772 / W&R710 / SP82 / Srcs830 / URW449 / Lau878 / STF487 / MP796 You shall go out with joy / The trees of the field (Stuart Dauerman) This is a good hand clappy foot stomping song. Fun. Good for kids. Oldy-but-a-goody. *NCH Psalter Let the hearts of those who seek God rejoice! Good joyous refrain, which could be used with the sung or read Psalm. NCH022 / VU221 Sing praise to God who has shaped and sustains all creation! (Neander / Marshall) A new translation of Neander's classic hymn "Praise to the Lord the Almighty…". I quite like this. Sung to LOBE DEN HERREN New words to old tunes. TiS 66 Sing to God, sing praises A good cantor and refrain. The refrain will also work well with the Psalm being read from the verses. *AoVK-24 / Iona (T1AU) / CH756 Bless the Lord (Kenyan). A good call and response chant – would make a good processional. Words are: Bless the Lord (my sisters), Bless the Lord (my brothers) Bless the Lord there is no other God. I think our congregation would really enjoy this. The tune is identical to Reamo Leboga. Sound sample of Reamo leboga (scroll to the 3rd album). *Iona / CH788 / MV104 / GtG659 Know that God is Good / Mungu ni mwema (Traditional Congo) This traditional refrain in Swahili is just lots of fun and very simple to sing. Good for kids and adults! Sheet music sample It's a while since we've sung this, but it's great! ATW 460 / Iona (M&G) / CH752 / VU717 / WoV610 Alleluia (South Africa) (Mxadana) Beautiful and peaceful, especially if you can work all the harmonies in. ATN 51 / SFFS 2258 / SiS / CP492 / MP601 Sing alleluia to the Lord (Stassen) A simple and familiar song to many. It has nice soaring Alleluias and is not too hard. 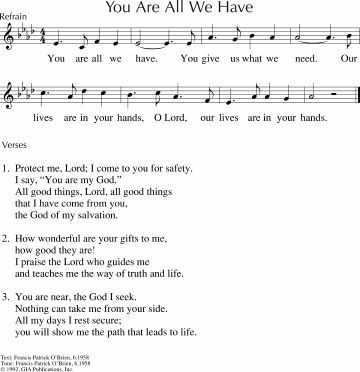 Substitute “Our God” if you like, as some hymnals do. MV187 / ELW682 We give our thanks / Reamo leboga (Traditional Botswana) A great song to sing for the offering. Sound sample (scroll to the 3rd album). We usually sing it much more quickly than this sample. ATFG537 Jonah was a prophet who lived many years ago (Pfeffer) Fun. Sung to the tune of "John Brown's body". Good for kids. ATAR684 Who am I? (Anon) A good song for kids about all the different people called by God. Mentions Moses, Jonah, Esther and Jesus. Good for kids. TiS 100 / AHB 3 / NCH017 / CH147 / UMH62 / VU217 / LBW527 / ELW835 / A&M532 / GA395 / HPP261 / GtG020 / PH455 / GtG015 / GC534 / GC(II)523 / G(3)611 / CP(E) / 250 / W&R23 / Cha022 / 82Hml-400 / Lau694 / StF099 / MP007 All creatures of our God and King (Francis of Assisi) A good classic sing! Hymnals vary a LOT in their translations and verses included. Using only Alleluia Alleluia or "Sing your praises" as some hymnals do, eliminates the "Oh praise him" which makes it annoyingly male exclusive. NCH has "To you, O God, all creatures sing" and eliminates all kingly language. ELW has "All creatures worship God most high". Lyrics and sheet music. Oldy-but-a-goody. TiS 132 / AHB 65 / NCH277 / CH651 / UMH64 / VU315 / LBW165 / ELW413 / A&M276 / HPP243 / GtG001 / PH138 / G(II)332 / GC475 / GC(II)483 / CP001 / CP(E) 202 / W&R136 / Cha004 / Srce243 / 82Hml-362 / Lau468 / StF011 / MP237 Holy, Holy, Holy, Lord God Almighty (NICAEA) Old other-worldly language, but a surprisingly inclusive (in most hymnals) classic, and a great rousing hymn tune. Different resources have slightly altered lyrics. A surprisingly non-inclusive sample can be found here. Oldy-but-a-goody. TiS 152 / NCH4 / UMH89 / VU232 / LBW551 / ELW836 / HPP22 / GtG611 / PH464 / GC529 / GC(II)520 / G(3)614 / CP425 / W&R59 / Cha002 / URW065 / 82Hml-376 Joyful joyful we adore thee Note that this hymn is not always very inclusive. I prefer more modern translations (e.g. TiS, VU, NCH, GC(II) ). Older version lyrics and tune sample. Oldy-but-a-goody. MV048 I can feel you near me God / Jump for joy (Mayberry) Good song for smaller kids about God being with us. I reckon you could get the kids to Jump in the chorus. Maybe it's a bit too happy clappy for some? Good for kids. Lyrics. *Taizé / MV009 O Come and let us sing to God our hope (Taize) "God's mercy is forever". Joyful gathering chant. Sound samples, sheet music. *Iona / CH788 / MV104 / GtG659 Know that God is Good / Mungu ni mwema (Traditional Congo) This traditional African refrain is just lots of fun and very simple to sing. Good for kids and adults! Sheet music sample. *CH101 You are kind and full of compassion (The Grail, Inclusive Language Version) This is not a hymn, but a beautiful paraphrase of this Psalm that could be read as a poem or alternate translation reading. *TiS 468 / NCH309 / PH436 We are your people, Spirit of Grace (Brian Wren). A bit long, but if you vary verses between men and women it's a bit more refreshing. The sudden high note at the end can throw newcomers to the tune a little, so if it's new, it's good to warn people about it. Lyrics and sheet music. *MV154 Deep in our hearts (Oldham) A good song about having a common vision and purpose. Easy to sing. NCH398 / MV044 / W&R599 / URW072 Shadow and Substance (Damon) Good clear words of being Christ's community in all our diversity. A simple tune. Lyrics and sheet music. The parable of equal pay to the workers in the vineyard who all started at different times. *MV127 I saw the rich ones (Mayberry) This is simple to sing and a great song for kids “The men in the vineyards were grumbling one day, I knew they weren’t happy with what they’d been paid… But with God the world is turned upside down. The poor are embraced and the lost they are found. Let’s work for a world where all people are free. Where it’s good to feel good about God loving you and me”. Good for kids. TiS 168 / NCH425 / CH231 / UMH97 / A&M284 / VU227 / WoV760 / ELW679 / GA426 / HPP287 / GtG036 / PH553 / RS704 / CP259 / CP(E) 254 / W&R723 / Cha714 / URW193 / StF124 / Lau731 / MP153 For the Fruit of All Creation / For the fruits of this creation (Fred Pratt Green) Some sources are quite masculine, but some OK. Very easy and well known tune and pretty standard words of harvest thanksgiving. The phrase "in the just reward of labour" would be an interesting discussion point for this passage. Sung to the well known tune AR HYD Y NOS. New words to old tunes Lyrics and tune sample. What will you be singing? I'd love to hear your ideas - please add them in a comment below!